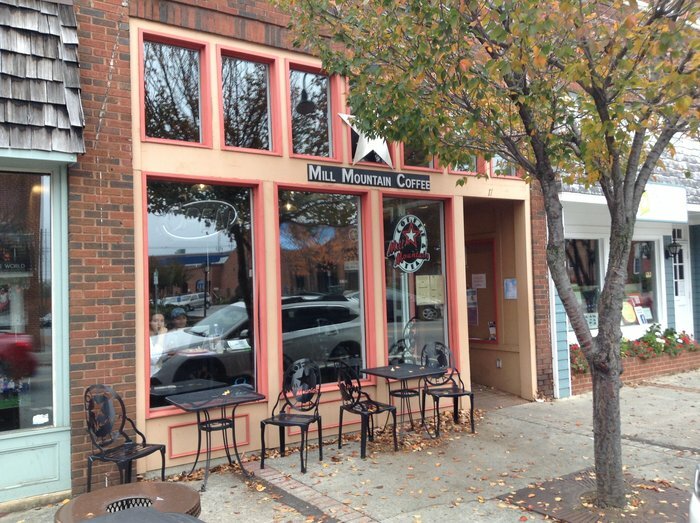 TotallyYourType: Mill Mountain Coffee and Tea, Salem: To Type or Not To Type? Mill Mountain Coffee and Tea, Salem: To Type or Not To Type? Today was the first day, in seven years or so working at coffeeshops or bars, recently 3-5 times a week, that I have ever been told "nope!" I had brought a typewriter to this same venue about a week prior, the same typewriter in fact, on October 28 and had no issues. I went in today and was told by an employee I was bothering people and needed to put my typewriter away. I finished a short paragraph, chugged my remaining coffee, and left, wishing I waited until I was leaving to put money in the tip jar... that dollar is long gone. I felt a deep sense of shame when I was told to pack up... they didn't kick me out -but they may as well have because the reason I went there was to work on some letters and poetry. The shame was irrational because this coffeeshop is a noisy place, with an espresso machine and their own grinders and even music, as well as plenty of people talking. I was told the people who complained were studying -there was a library right across the street though and I don't think there is an expectation of quietness in a coffeeshop, not generally. On the flipside, it would have been quite rude of me to go in and start playing a trombone -just because this place is "public" and I could. But I think a typewriter is grey area. And they are far less noisy. The restaurant has a right to decide how they want to treat customers and who they want to grant preference to. They were in a sticky situation, and what they did was not unfair, even if it was upsetting to me. They have every right to have acted exactly like they did, and they were professional about it. Just as I have every right not to return there, and to tell my friends there might be better places to buy a cup of coffee. And to blog about it. After the employee had confronted me a customer immediately jumped up from a few tables away and told me he loved the sound, and his wife and him were just talking about it, and he was deeply sorry what had happened. This is the usual reaction I get if I get any in the places I usually work. Some delis and coffeeshops even welcome me in with excitement, "It's the typewriter guy!" and with big smiles. I generally prefer to be ignored, but positive attention is much better than negative attention. I was thankful someone had come over to say something kind, it alleviated some of the embarrassment and shame I was feeling. I think I blushed while being scolded. I thought I knew Salem, and I thought it was a safe place for me to be myself and to work. It was shocking and unsettling, Salem is close enough to home to be home. Look for two blog posts coming soon, "What to do if asked to leave while typing publicly" and "What to do if someone begins typing in your coffeeshop or bar". There is a part two to this story, posted very soon, about follow up from management in response to a letter I sent. It turns out the actions of the employee were against company policy and I did receive an apology. When asked to leave Mill Mtn. in Sallem. go to the one in Roanoke. I spent many a quite Saturday (before the Market opens) or Sunday morning there. Then that was before PCs and typewriters became popular. I felt terrible when I was asked to stop typing on a plane. I'll never do that again! But I have not had trouble in coffee shops. Admittedly, I don't go there often with a typewriter. It depends on the atmosphere of the place and who is present. You have certainly had a very high ratio of hits to miss! So sorry this happened to you Mark. Their loss. We need to make up some creative Typewriters Welcome signs to distribute to coffee shops and bars. That way staff can simply point at the sign when asked. The revolution will be typewritten!